One field I know virtually nothing about is that of glass. We’re starting to pick up more and more pieces on each of our trips; this time, I think we got some of our best ones. We must have an eye for greens and blues in glass: virtually all of our pieces are in varying shades. The smaller vase was bought on the last but one trip; the larger last time. I didn’t realise they were slightly different colours until I put them together for that picture: I’d bought the bigger one thinking it matched the other one. Sticknobills at the Pottery and Glass forum has been filling me in about some of these glass pieces. 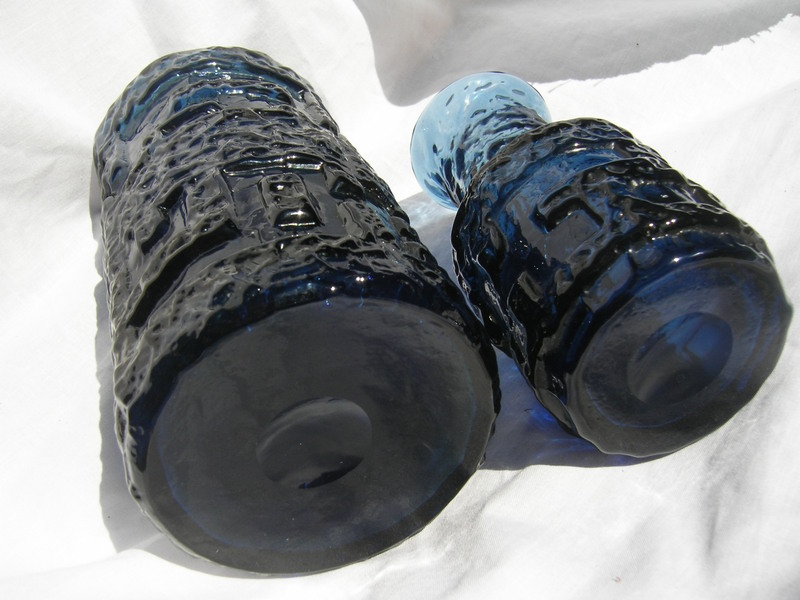 These vases are Vase 1379 for Riihimäen Lasi (1970), designed by Tamara Aladin. 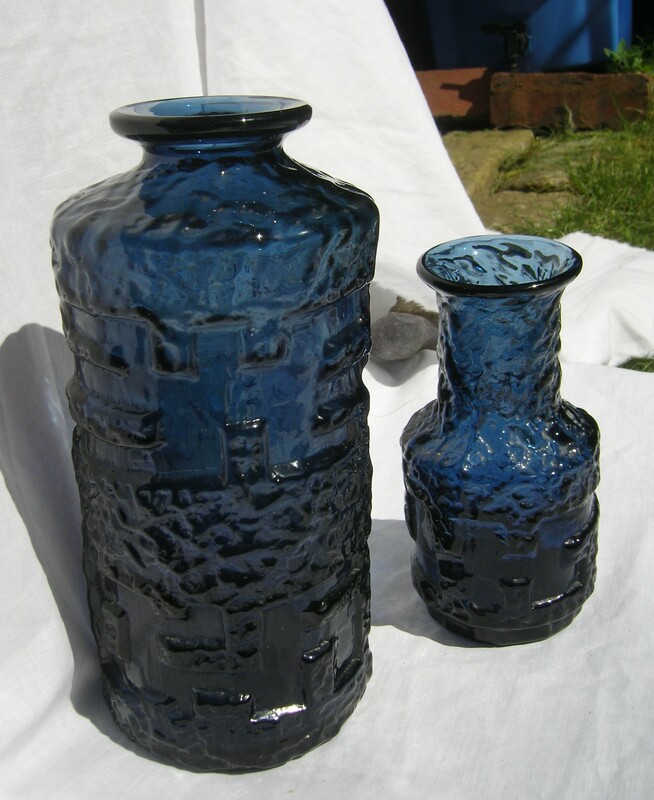 If you ever have queries on any piece of pottery or glass, the forum must be your first port of call. The members there are amazing at identifying pieces and providing that extra bit of information about them. The label on this one reads, Svensk Form, Bo Borgstrum, Sweden, Aseda.” I orginally thought this was called ‘Seda’, having not realised the stylised A on the logo was part of the name. Thanks to Ursa_Major at P&GF for telling me this! These are ‘unknowns’ at the moment. I’ve posted them up on the Pottery and Glass forum and am combining writing this with discussions about them. Hopefully someone will have identified them before I finish writing this. I’ve got a few more to post as well. Unfortunately, my wordpress has started messing around with where I can insert pictures again and my patience is running out! Think I’ll carry on reading ‘The Crimson Petal and the White’ in the garden while Aidan takes pictures of pottery. He’s uploading a bumper crop to Ebay this evening so make sure you have a look. I love a lot of the pottery I’ve seen on your blog, but these glass ones are the best I’ve seen yet. Gourgeous! 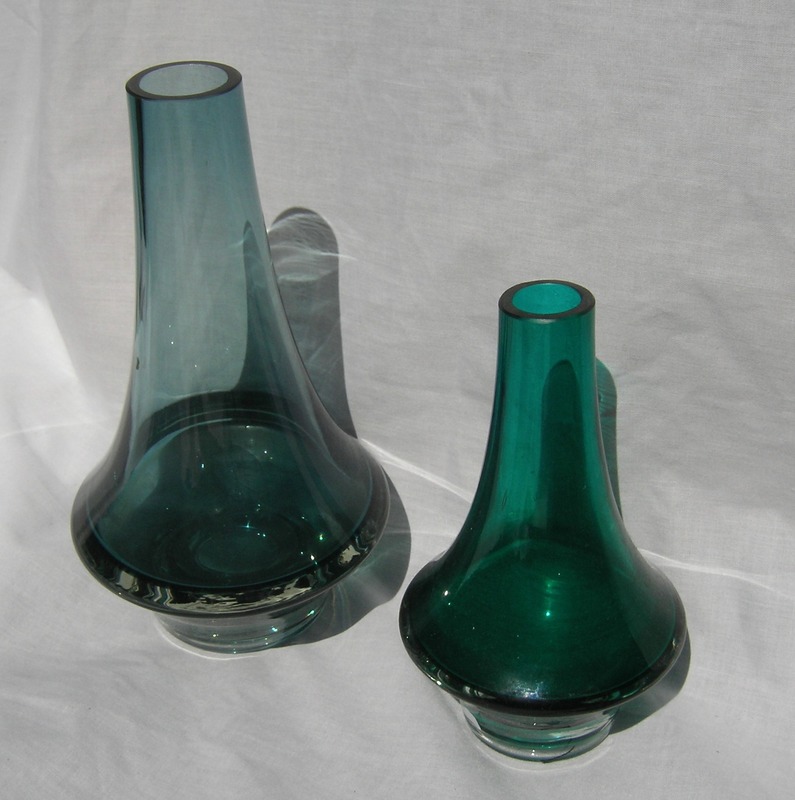 Hi there, these two last objects are designed by Gote Augustsson, Ruda glasbruk.